Avon is an unincorporated community and census-designated place (CDP) in Dare County in the U.S. state of North Carolina. As of the 2010 census, it had a permanent population of 776. 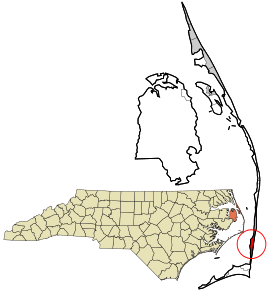 Avon is located on the North Carolina Outer Banks at latitude 35°21'7" North, longitude 75°30'39" West. 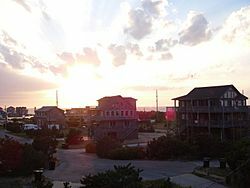 The village is south of Salvo and north of Buxton on Hatteras Island. The United States Postal Service has assigned Avon the ZIP code 27915. According to the U.S. Census Bureau, the Avon CDP has a total area of 2.41 square miles (6.24 km2), of which 2.36 square miles (6.10 km2) is land and 0.05 square miles (0.14 km2), or 2.27%, is water. Avon is bordered to the east by the Atlantic Ocean and to the west by Pamlico Sound. Historically named "Kinnakeet", the village was renamed "Avon" by the U.S. Postal Service when a post office was established there in 1883. The U.S. Life-Saving Service constructed the Little Kinnakeet Life Saving Station in 1874, remaining active, under the Coast Guard from 1915, until decommissioned in 1954. The building is now part of the Cape Hatteras National Seashore. Avon, North Carolina Facts for Kids. Kiddle Encyclopedia.